How have I been knitting for 15+ years and still not yet knit a Wool and the Gang pattern? Weird, huh? So the Julia Sweater is my first one. It's also been in my WIP basket for six months. I realized this when I went on a recent cleaning frenzy. I was told that in order to heal a back/hip sprain (that I think I got a year ago lifting heavy things in my backyard) I must drive very little and walk and stand a lot. Oh, and I can clean house. Thanks, Doc. When I do go somewhere farther than 5 minutes away, it's with the shotgun seat cranked all the way back, gangster-style, and my husband or one of the kids chauffeuring. Yes, I am a diva now. 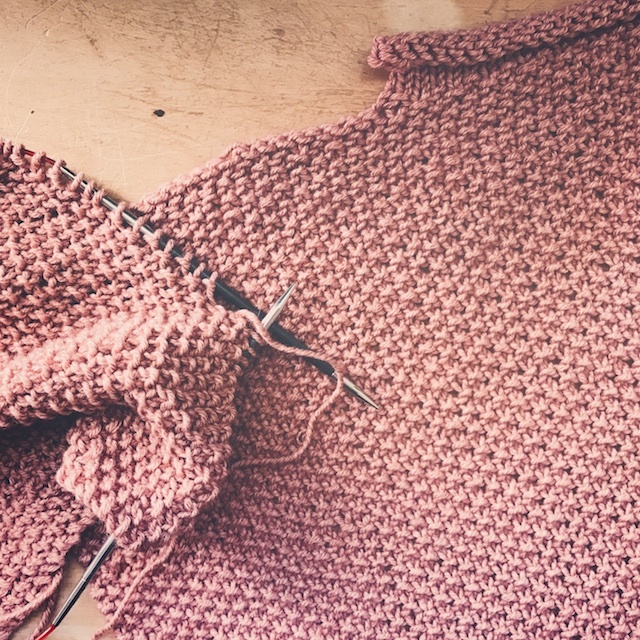 Anyway, I had started this sweater because of it's uncomplicated nature- oversized, drop shoulder, and seed stitch. I thought it would be perfect for waiting rooms and dark movie theaters. Simple and shapeless, it still looks great... at least when WatG styles it. It's the kind of sweater you want to put on and leave on until either yourself or the sweater requires a hose-down. I've since realized, however, that seed stitch stinks in a dark theater, so it went into the basket until about a week ago. The pattern calls for Shiny Happy Cotton, labeled as a bulky yarn, but I'm using Classic Elite Chesapeake which is worsted. Shiny Happy Cotton is rated as a Dk weight yarn on Ravelry, so mine has been a good substitute. It's also only 50% organic cotton, then 50% wool. I thought it would make it lighter, warmer, and keep it from sagging with wear. (By the way, it's a discontinued yarn, but Webs still has other colors on super sale right now.) I really like the way it feels to knit with. It is easier to work with than pure cotton and it's a pretty color. Pretty color is essential when you're making four million seed stitches. This would have been an excellent sweater to knit as a new knitter, back when every stitch felt like a mini miracle. I could've practice tension, knits, and purls, but not have to worry about difficult seaming or perfect sizing. If only WatG existed when I was just starting out! However, I would've found the cost of kits too high for my budget back then. They do rotate their patterns for sale separately, though. That's why I have several, without the kit yarn, just waiting in the queue. When I think about Wool and the Gang, I can't help but think of all the companies and individuals that have borrowed their aesthetic, pattern ideas, packaging, etc. I know I wrote a post up on We Are Knitters a while back, but I've come to feel uncomfortable using their patterns. I did enjoy knitting the kit I bought, and I will eventually blog about it, but I don't think I'll be buying more. It's hard to know where to draw the line on flattering imitation and calculated replication. So many designers and companies are all riding the same trend waves that it's inevitable that some will simply be slower to catch on. That's just timing. But, then there are times, like this when it's an obvious rip-off of a lesser known designer who will be unlikely to challenge it. Makes me think of something I read years ago about Urban Outfitters. To this day, I really don't like that company. I'll admit I've bought some records there, though. 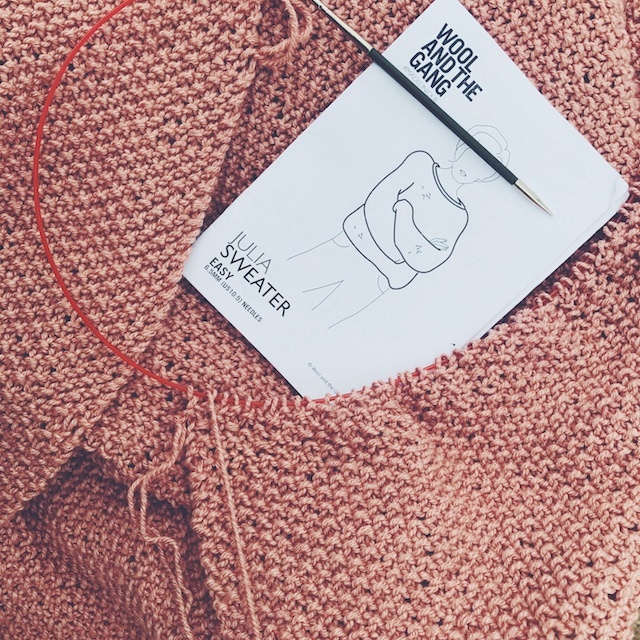 If you take a look at all of the similarities between We Are Knitters and Wool and the Gang's business concept, packaging, promotion, and advertising it can't be accidental and, even if it's a normal business practice, I personally don't like that kind of thing. I remember reading a Flickr friend's thoughts on imitation in photography. She said something like she thought if she made at least three significant changes to the concept, it was a case of inspiration, not imitation. And, looking at her muse's photo next to her own, it seemed just that. Not to mention, she wasn't selling her photo, just creating for the sake of making. Her goal was self-discovery, not monetary gain. I'm not sure why that has stuck in my head all these years, but I agree. When I borrow I like to give credit, link up, hashtag, whatever. I don't need to pretend I'm the source of all ideas. This applies to articles I read and things I knit. Really, is there anything more annoying than when someone makes a clever remark and the person standing next to them starts repeating it louder, over and over for attention? Blah. Same principle, here. 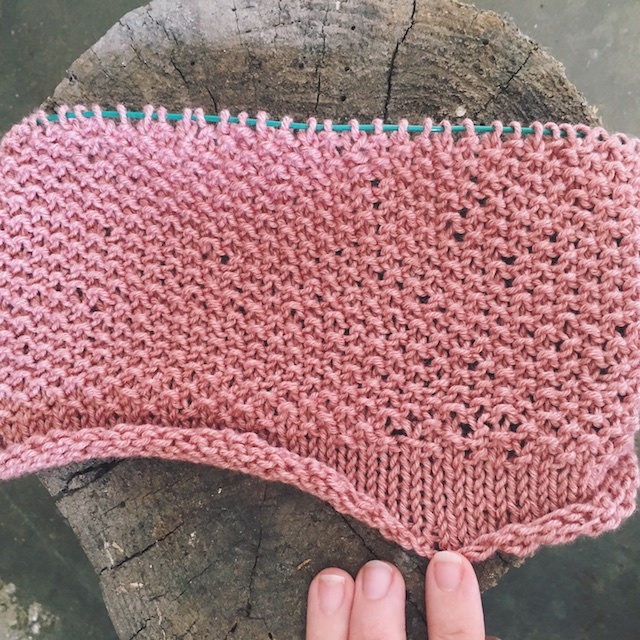 I wrote up a pattern, years ago, and put it on Ravelry for free only because the Madewell cowl I borrowed the idea from was no longer for sale. It was a total copy and I freely admitted it. I would never have printed it if the original was still available to purchase. I loved the experience of seeing something and trying to recreate it, and that was all. That was totally a case of filling a pattern void, not pretending to be the designing OG. 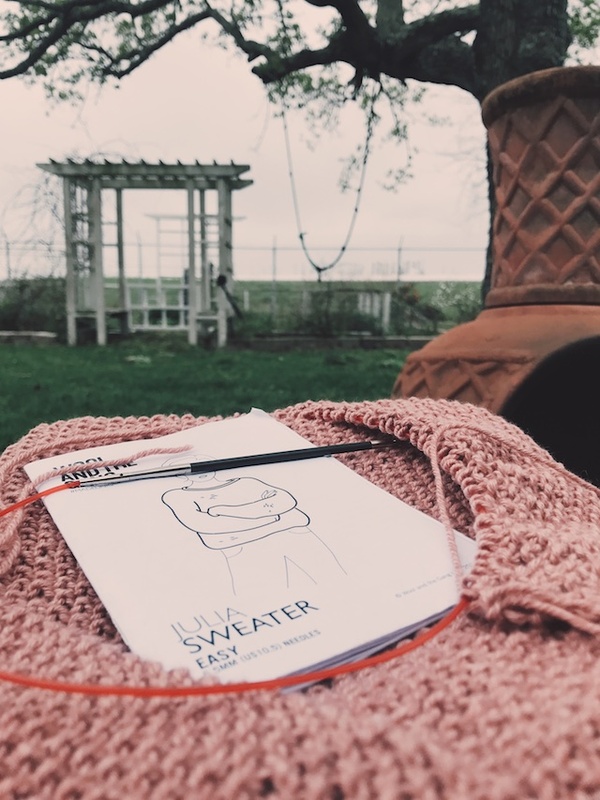 Actually, I'm sure I could've looked at this sweater sample and knit a copy without purchasing, but why not give a few bucks as credit to the ones who made me think of it, especially when I'm going to be putting my FOs on my blog? I really like supporting designers. My appetite for patterns is too big for my available knitting time. Having said that, I realize there are tons of sellers ripping each other off on Etsy all the time. It would be difficult to keep track of it. It's also difficult to notice how much of the barrage of images we see each day is settling into our subconscious to influence our creations. But, when a larger company picks on the little guy, it really bugs me. Must be my father's labor union influence. So what's the test for innocent vs self-promoting imitation? Will it steal customers? Is it almost exactly a copy, or heavily modified? Is it styled the same? Does the product name or ad copy read the same? Is it a pattern of behavior or a one-time coincidence? So, yeah, I'll stick with Wool and the Gang for knitting kits. I do have kits for the Tommy Top, Milo and Piazza bags, and Shakti Shorts. I can't wait for summer to knit these. Have any of you knit Wool and the Gang patterns or want to?